JOWA RO reverse osmosis water maker is a compact plug and play system designed for tough marine environment. 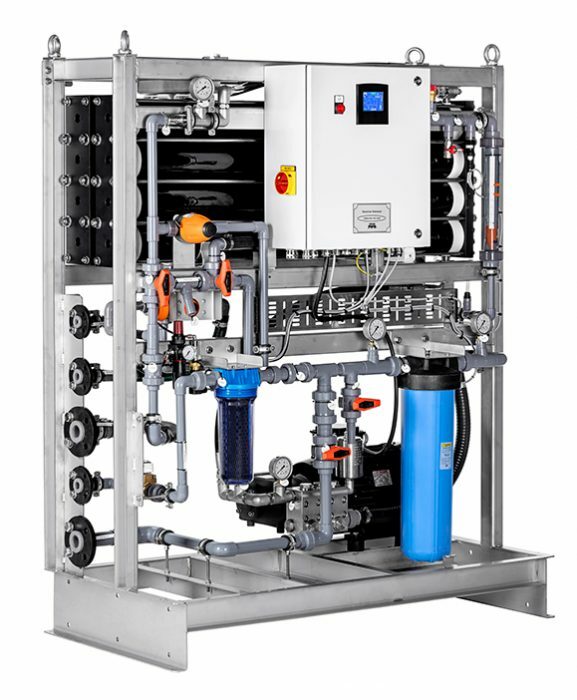 Reverse osmosis desalination is among the finest levels of filtration available. The RO membrane generally acts as a barrier to all dissolved salts and inorganic molecules. Water molecules, on the other hand, pass freely through the membrane creating a purified product stream. Rejection of dissolved salts is typically 98% depending on factors such as membrane type, feed composition, temperature, and system design. Capacity is 15T or 30T potable water per day. Continuously monitoring and automatically divert the product flow depending on salinity value. Full production with a temperature between 6-35C° and TDS 35 000ppm (salinity). Unique design with top quality HDMI interface. User friendly touch screen and prepared for communication to ECR/AIS via PROFIbus, CANbus, MODbus and more.